This is taken from the end pages of Poe Goes Punk. LET ME introduce myself. I’m Lia Rees, the designer of this book. You’ll have noticed my graphics along the way. I thought you might be interested in a peek behind the scenes at the visuals of this project. Design isn’t always appreciated. The romantic view is that the written word should speak for itself. But written words don’t slip into a reader’s mind unlooked for and unasked. The reader has to invite the author in; the author has to engage the reader’s interest before words enter the picture. That’s where design comes in. Perhaps I lied to you slightly. Everyone admires a beautiful book cover, but there’s no glamour in page layout. 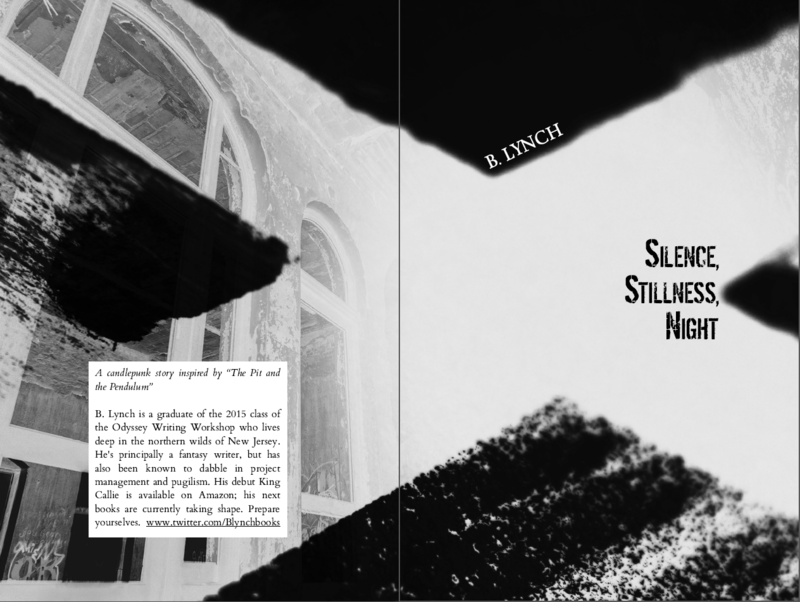 Still, a well-crafted paperback needs the silent work of a designer (or an author-designer) . We ensure that the type is readable and the structure easy to navigate, and we also engage in the more nebulous art of setting a mood for the reader. With just a few visual cues, like a magician’s sleight of hand, you’ll absorb the genre, the tone, and how professional-or-otherwise the book feels. Good design connects with the right audience and turns off the wrong one. Yes, turning off certain audiences is a good thing. An author doesn’t want their horror novel accidentally bought by chick lit readers, or their smutty romance picked up by 12-year-olds. 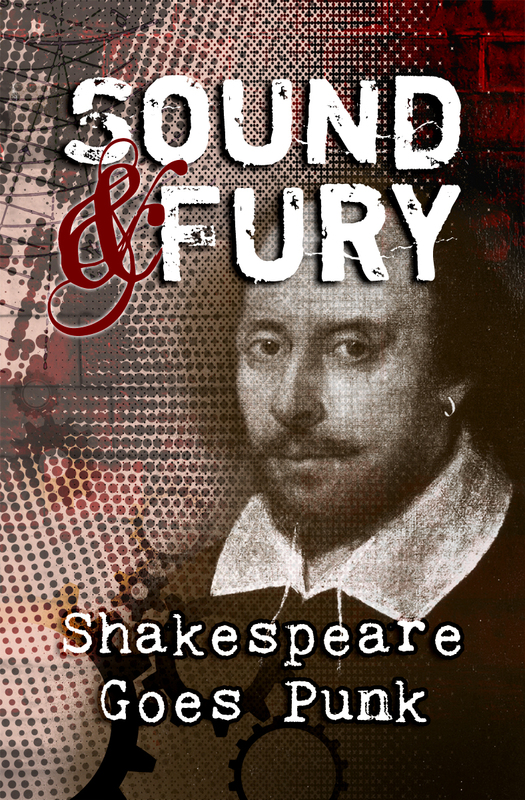 Sound and Fury was the first book in our Shakespeare Goes Punk series. This is always where the heavy lifting of the design process occurs, as the series “brand” is created here. I use the word with some reluctance, because it makes books sound like Coca-Cola, which you have to admit is not punk. But there’s no other word to encompass it all; believe me, I’ve searched. I worked with Elizabeth Hamm to define the brand in terms of fonts, colours, embellishments and general mood. Our first challenge was reconciling two disparate aspects of the brief. “Shakespeare” and “punk” are not a natural fit, yet somehow we had to communicate both. If we went too far in one direction, the other part would be lost. 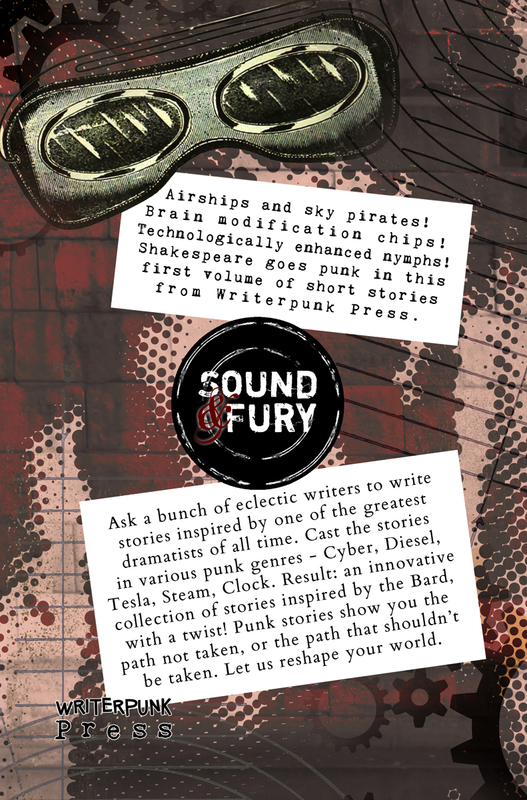 In addition, there are a few punk genres featured in Sound and Fury—cyberpunk and steampunk are the biggest. Each has its own established aesthetic, but it would be messy to include both and misleading to represent just one. We also rejected a deliberately vintage “Shakespearean” style because it wouldn’t have been punk enough. Elizabeth is an illustrator whereas I can’t draw for toffee, so she was tasked with drawing an original cover concept. It had some lovely elements; hand-drawn goggles, notebook-paper lines and a vintage image of the Bard himself. I believed it needed to be bolder, as ebook covers are seen first as thumbnails, so I created a new version. My aim was to capture the broader meaning of the word “punk”. It may be a literary genre, but that’s a recent development. Most people know it better as a brash, subversive attitude. So what does punk look like? Bold and loud—we all agree on that. For the title, I chose an eye-catching grunge font (Shortcut) from Misprinted Type. The lettering screams roughness and energy, setting the tone for the entire design. This font is the rock star who slouches in late and stubs out a cigarette on the magazine you were reading. Elizabeth added a little class by using “Selfish”, a script font, for the ampersand. (Perhaps the rock star’s long-suffering model girlfriend). Other fonts had to play supporting roles. I tipped a hat to writer cliché by using the typewriter font Kingthings Trypewriter for our subtitle. Elizabeth found my version of the cover too brash and busy, so it was pulled back and a balance was struck. After a lot of fine-tuning (and versions sent via Dropbox), we ended up with a final design we were satisfied with. We needed a stable layout for the internal pages that wouldn’t have to change with every instalment. The covers would differ but the internal look would stay consistent. I wanted a book with an indie DIY feel, in homage to the comics and fanzines that practically everyone in the group was into. But the book still had to be readable. The stories themselves were long and involved, so I had to resist the temptation to load it up with graphics and fancy fontwork, giving the false impression of a comic book. If the right readers avoided it and the wrong ones bought, my beautiful lie would backfire on us all. I chose three heading fonts to go with three levels of headline. Elizabeth’s calming influence ensured they weren’t too way-out. Big splashy full-page titles were done in Shortcut, the cover font. I used the minimalistic Rafale with a subtle stencil effect for mid-level headlines. Finally I used Kingthings Trypewriter again for the smallest headlines. It seemed to fit the DIY aesthetic, and was cool but not too distracting when it occurred mid-story. I started a policy of crediting all the font designers in the publishing information of each book. If layout artists are underappreciated, font designers are practically invisible outside their own sphere. “Writers” and similar seemed like rather dull headings, so I am to blame for “People To Blame”. The bold separator graphics in that section are a font called Angst Dingbats. The quote at the start of the book was also my idea, as were the small capitals at the start of paragraphs. I wanted to add a literary flourish and balance out the punk. After the book came the publicity. I used the same graphics in the promotional banners, website and video trailer, to give the whole project a consistent mood (“branding” again). There was a nasty surprise near publication day, when the printed proofs arrived with a pinkish tinge to the cover. I was taking a week’s holiday for my fiancé to fly over from Utah—this would be our first real-life meeting—and I wasn’t too pleased. But the book title wasn’t Shakespeare Goes Pink, so I tweaked the colours and back to proofing it went. Carol still has the pink version as a memento. 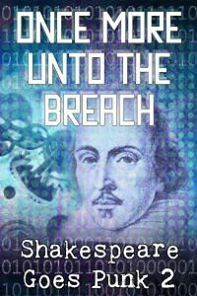 For the second book, Once More Unto The Breach, I worked on the internal layout but not the cover. My role was easier this time as the template had already been made. I was advised to put heavy black borders around the individual story title pages, so readers flicking through the paperback would see where stories started and ended. I went further and used all-black pages with a faded repeat of the cover image. As I write this, I am designing a full-colour book to be sold at Shakespeare’s Globe. It’s my first full-colour project, and my biggest yet. Without Shakespeare Goes Punk, I would never have developed the skills, portfolio and network that brought me to this point. It has been an absolute pleasure.